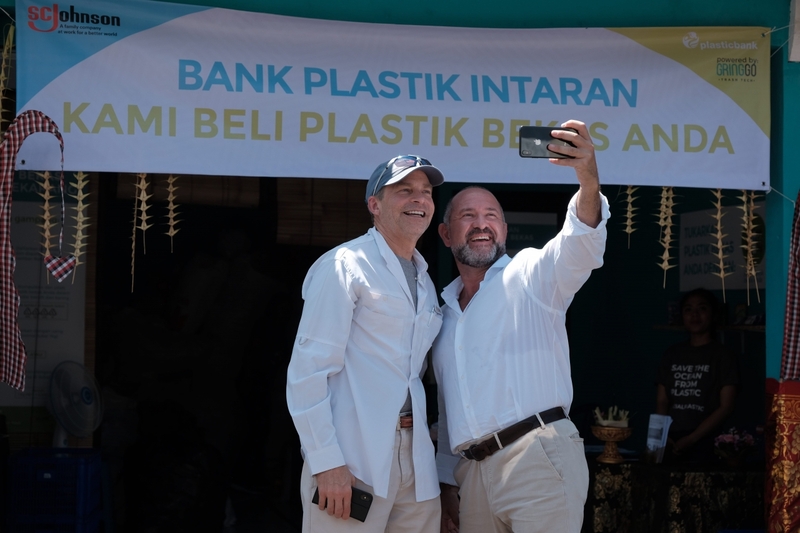 Fisk Johnson, Chairman and CEO of SC Johnson and David Katz, CEO of Plastic Bank, open the first of eight recycling centers in Indonesia. 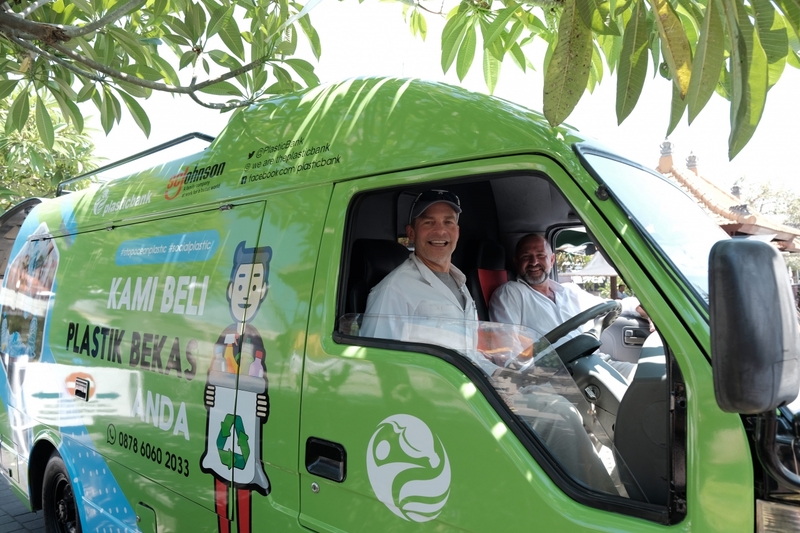 Fisk Johnson, Chairman and CEO of SC Johnson and David Katz, CEO of Plastic Bank, unveil a mobile collection center in Indonesia. Nyoman Darti collects plastic waste in the new recycling center opened by SC Johnson and Plastic Bank in Bali, Indonesia. RACINE, Wis., October 28, 2018 /3BL Media/ – Today, SC Johnson is announcing a new partnership with Plastic Bank, one of the leading organizations working to reduce the global crisis of ocean plastic, to help increase recycling rates in impoverished communities across Indonesia while addressing the challenges of poverty. Ocean plastic is a global crisis, with the equivalent of one dump truck load every minute entering the world’s oceans, mainly from Asian countries. [i] At the same time, many communities affected by plastic pollution face high levels of poverty. SC Johnson and Plastic Bank will open eight recycling centers in Indonesia during the next year. 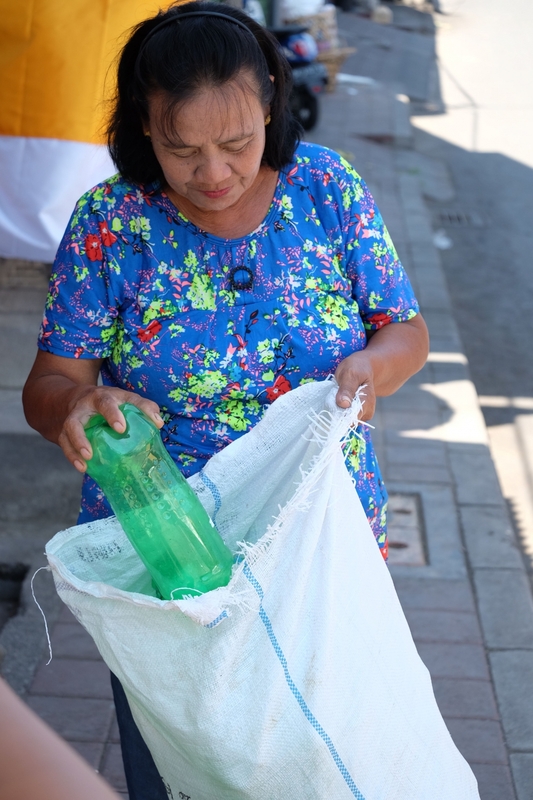 Local waste collectors can bring the plastic they collect to any center, where they can exchange it for digital tokens. Using innovative Blockchain technology, they can then use the tokens to buy needed goods and services – reducing the risk of loss or theft. Nearly 28 million Indonesians live below the poverty level and could greatly benefit from a program of this scale. Each center will have a minimum capacity of 100 metric tons of plastic per year, with opportunities to exceed that in the future, and is expected to provide opportunities for hundreds of local waste collectors. The first center officially opened in Bali on October 28, with all centers planned to be operational by May 2019. This program, which can be expanded to additional countries, will help reduce plastic leakage into the ocean through creation of an ongoing recycling infrastructure and by incentivizing local waste collectors to join the fight through increased access to needed resources. The program will also educate the local community about the growing threat of plastic pollution and about opportunities to recycle locally. Champion curbside recycling of plastic film. SC Johnson will continue its effort to make curbside recycling of flexible plastic film such as Ziploc® brand bags a reality in the U.S. SC Johnson is also promoting reuse of Ziploc® brand bags, which are made to be reused many times. Plastic Bank is a platform for the world to gather together to STOP Ocean plastic and alleviate poverty through a global recycling ecosystem. Plastic Bank acts as a convenience store for the world’s poor that accepts plastic waste as a currency. This recycling ecosystem is sustained through the sale and use of Social Plastic® by some of the world's largest organizations. Over 1 million supporters have asked brands to support Plastic Bank and Social Plastic®. In addition to using our recycled Social Plastic®, both individuals and companies have the ability to offset their own plastic footprint. This is how we unite the world to reduce global poverty while making plastic too valuable to enter our oceans. Plastic Bank has realized that the only way to stop Ocean plastic is to reveal the value in plastic by transferring as much of this value into the hands of the collectors. Social Plastic® is Plastic Bank Verified plastic that provides a premium for the collector. The premiums are called Plastic Bank Rewards. These rewards are distributed and authenticated through the Plastic Bank app, which uses Blockchain technology to provide the safest and most trusted means to deliver a globally scalable social impact. All of the plastic collected through the Social Plastic® ecosystem is sorted, recycled, and sold to forward thinking brands to use in their manufacturing instead of new plastics. Plastic Bank aims to provide large scale sustainable premiums in every recycling community around the world. This is how we stop Ocean plastic. The more premiums that come from corporate purchases of Social Plastic® and/or off-set incentives the faster new regions can become eligible to receive Plastic Bank Rewards.